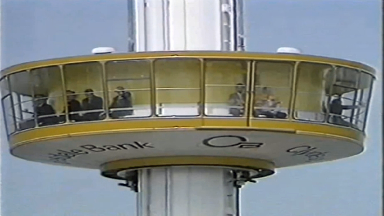 Who remembers riding the Coca-Cola roller coaster or seeing the giant floating head? The year was 1988, a giant floating head was wallowing in the Clyde, Oor Wullie's bucket was in place and the roller coaster to top all roller coasters snaked above the Glasgow skyline. There were rumours of giant yellow teapots, a talking cactus and £1 imitation Ray Ban sunglasses which, by the end of the month, every school kid in the city would be wearing. It was Thursday, April 26 and The Glasgow Garden Festival, the first event of its type to be held in the city in 50 years, had officially opened to the public. It was massive, both geographically speaking and in terms of the sheer number of excited Scots who turned out to enjoy it. Stretching 120 acres along the Clyde, it was the third of five National Garden Festivals, and the only one to take place in Scotland. 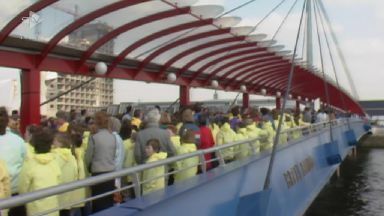 The event attracted a staggering 4.3 million visitors over 152 days. According to reports from the time, when the festival was set up around 80 buildings and bridges were nominated for floodlighting, British Rail was asked to clean up embankments and even the Scottish Gas Board agreed to paint a gas holder a cheerful blue instead of the usual bland slate grey. Apparently, 15 foreign correspondents representing news media in America, Austria, Belgium, Brazil, France, Germany, Israel, Saudi Arabia, and Spain came to Glasgow to see what was going on. Attractions included the Coca-Cola Thrill Ride, a 250-foot tower celebrating the Clydesdale Bank's 150th anniversary, the Bell's Bridge - the first significant footbridge to be built over the Clyde for 120 years - the biggest tea pot in the world, water taxis, the return of tramcars for the first time since 1962, a railway, 112 gardens, 24ft metal and glass fibre irises and tea towels made in Pakistan. There were also six major theme areas; health and wellbeing, water and maritime, recreation and sport, landscape and scenery, science and technology, and plants and food. As the city marks 30 years since the memorable event, we take a look back at some of the key moments and attractions that won eighties hearts. 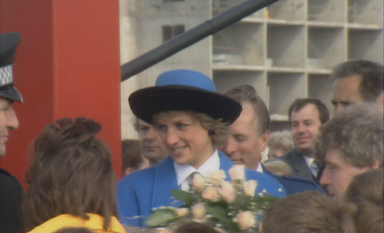 The event was opened by Prince Charles and Princess Diana who had travelled up for the special occasion. And to keep your door locked was considered absurd." Ask any Glaswegian who attended the event in the eighties and this is the attraction they will remember first - the hair raising Coca-Cola roller coaster ride! This was a major deal in the city at the time, many children had never been on a coaster before so this was their big moment. A £3 ticket got you three shots and the screams could be heard for miles. The floating head was one of many pieces of public art commissioned for the festival. A sort of cement boat by artist Roland Groom, it now sits on the south bank of the River Clyde next to a scrap yard. Oor Wullie's Garden was a pretty big highlight of the festival - it included a bucket for visitors to have their photo taken with for a true 'Wullie experience'. 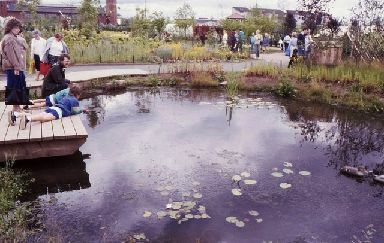 The garden was constructed by a team from Glasgow Urban Wildlife Group, Scottish Conservation Projects Trust, Scottish Wildlife Trust and Glasgow University. Everyone loved the trams. 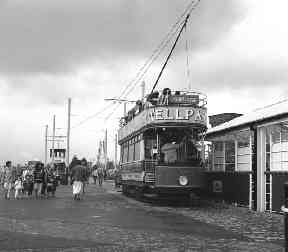 A tramway was set up at the festival, featuring two trams borrowed from the National Tramway Museum, including the ex-Paisley No 68. They allegedly ran up more than 4000 miles during the event. As one of Britain's largest tramcar operators, Glasgow Corporation had extensive workshops of its own and, over time, developed a series of tramcars that - because they shared a number of distinctive features - came to be known as 'Standards'. The Glasgow 'Standards' constituted one of the most numerous and successful types of tramcar in the country, the 1,000 or so examples of which were exceeded only by London Transport's E/1 design. The Clydesdale Bank Anniversary Tower dominated the skyline during the Glasgow Garden Festival in 1988, particularly at night. It was the focal point for the site, but it did not survive to become a permanent feature of the Glasgow cityscape. The Clydesdale Bank sponsored the tower for around £500,000 to mark the 150th anniversary of the bank's foundation in Glasgow in 1838. 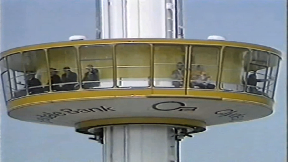 A special feature of the 240ft high tower was a glass doughnut shaped gondola which rose and revolved at the same time, allowing extensive views over the city and beyond. Family housebuilder Mactaggart and Mickel were the ones behind the 'Broom Milk Bar' - a temporary Art Deco style Milk Bar that was built on Glasgow Green. It was managed by the Scottish Milk Marketing Board. The South Rotunda was reinvented as the Dome of Discovery for the Glasgow Garden Festival. It went on to become a 'hands-on' science centre in 1990 and planned for a one year opening as part of Glasgow's European City of Culture celebrations. The centre housed more than 50 interactive exhibits, a workshop and small shop. A geodesic tent provided the space for outdoor presentations and lectures which were performed daily. 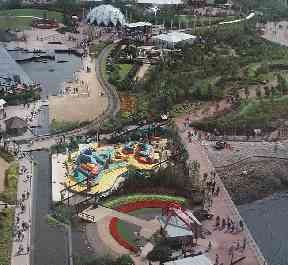 The project was successful enough to be extended beyond it's original lifespan and operated from 1990 to 1992. The final night of the festival. Perhaps the least positive memory of the festival though was the great fireworks final at the end of the run on Monday, September 26. 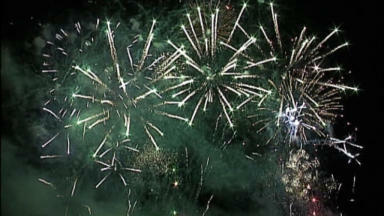 It went badly wrong and one man lost part of a leg when a firework exploded prematurely. An eight-inch diameter shell exploded within its launching tube on the ground instead of when the shell was high in the air. An investigation later cleared the festival organisers of blame. Mr Alastair Macfarlane, of the Shell Shock Firework Company, was the victim who lost his leg in the explosion. As he said in an interview with The Herald at the time: ''I've been very lucky. I've been given a second chance. 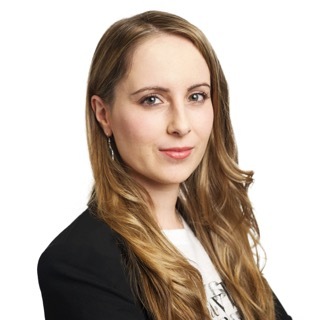 "It was a bit like stepping on a mine, but the accident was just a chance in a million." Thanks to the garden festival event, an estimated £100m was injected into the local economy, and a further £170m spent in the five years immediately after. Two years after that, Glasgow was awarded the European City of Culture. In 1999 it was named the UK City of Architecture and Design. By the time it came to the Commonwealth Games, the city was a pro at staging landmark events. Many of the attractions from the event are still loved and remembered by the many who visited between April and September 1988.